A fun twist to a traditional winter craft. 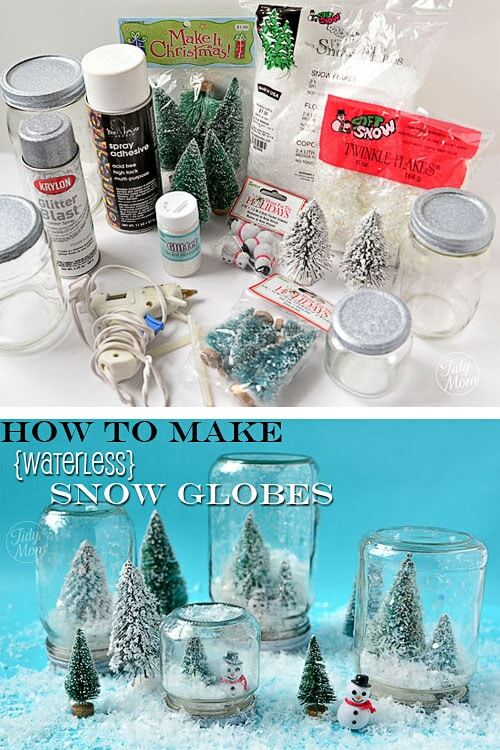 Learn how to make waterless snow globes. I’ve been meaning to make these for the last few years! It’s such an easy craft anyone can make them and the possibilities are endless! Make it a party and serve a plate of snowman cookies, Christmas tricolor cupcakes, and Red Velvet Hot Chocolate to enjoy will you’ree crafting!! 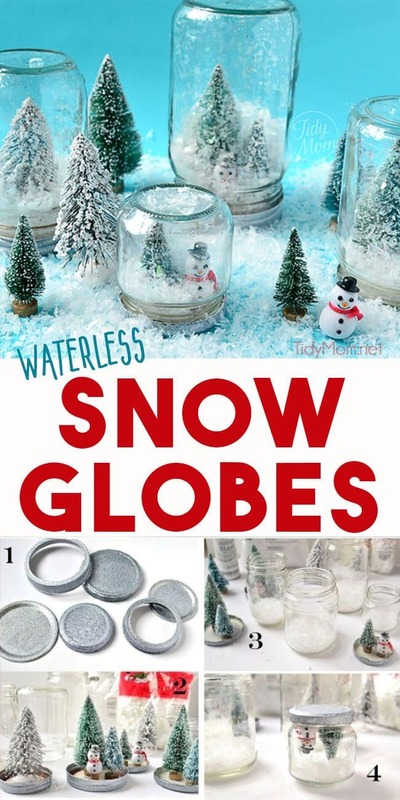 Waterless snow globes are fun to shake, don’t break and so easy to make, even a kid could do it! Start by removing the lids and paint them with the spray paint. I used the Krylon Glitter Blast in silver, but white would work just as well. Next, and this is totally optional (step not shown) – I sprayed the trees and snowmen with spray adhesive then sprinkled with glitter for a little extra sparkle. 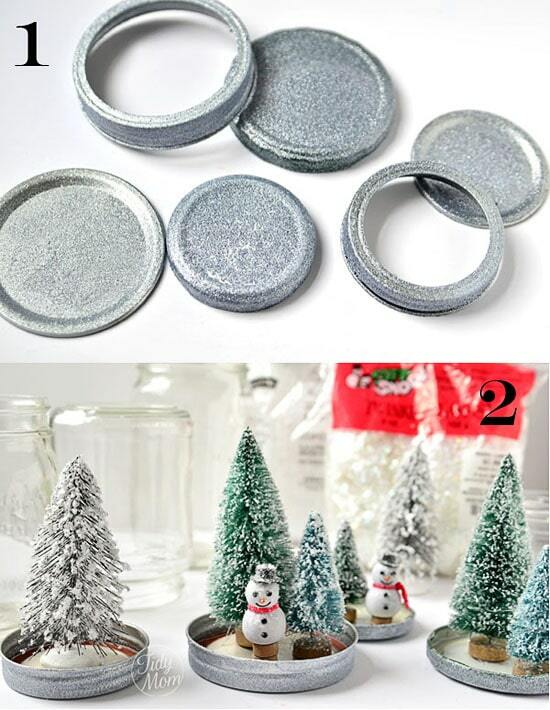 Now you are ready to hot glue your trees and snowmen to the lids (I also glued the canning lids together). It’s time to add the snow. 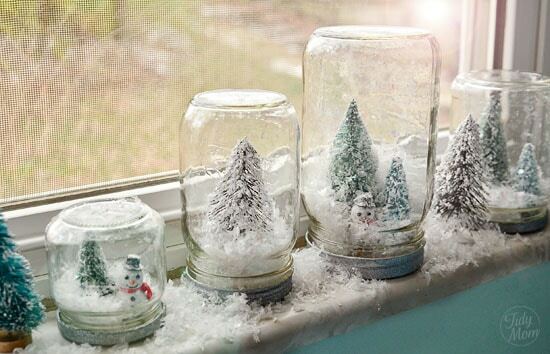 Fill jars with just a little snow. You don’t need much, you don’t want the snow to bury your snowmen or trees. Just add enough snow to cover the bottom of the jar. Time to put it all together!! 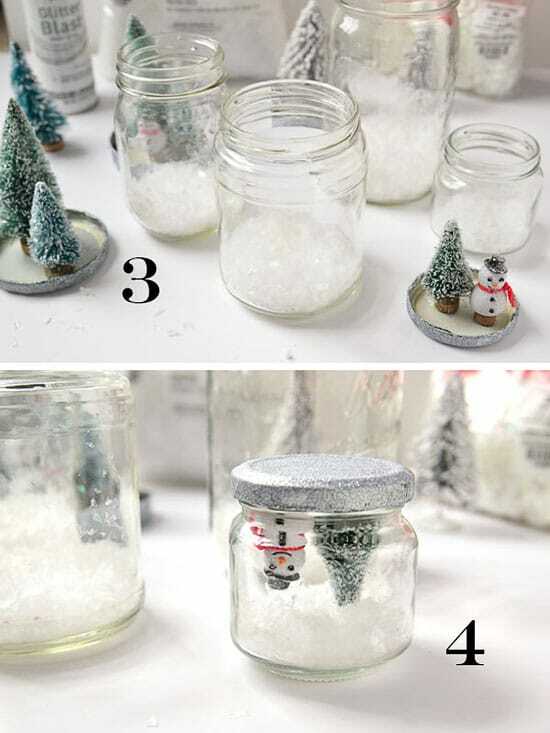 Since your trees and snowmen are glued to the lid, you can now pick up the lids and screw them back on to the jar. Turn them over and you’re done! LET IT SNOW, LET IT SNOW……LET IT SNOW! Go ahead and shake them up and watch the magic in their eyes! These are just too fun and easy to make – after waiting for my lids to dry, I made all 4 of these in under a half hour. 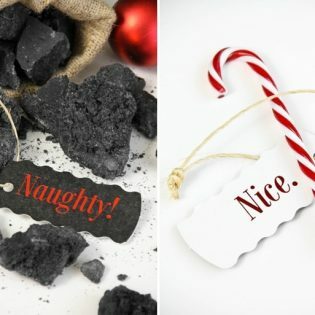 It’s a great holiday craft to do with the kids! 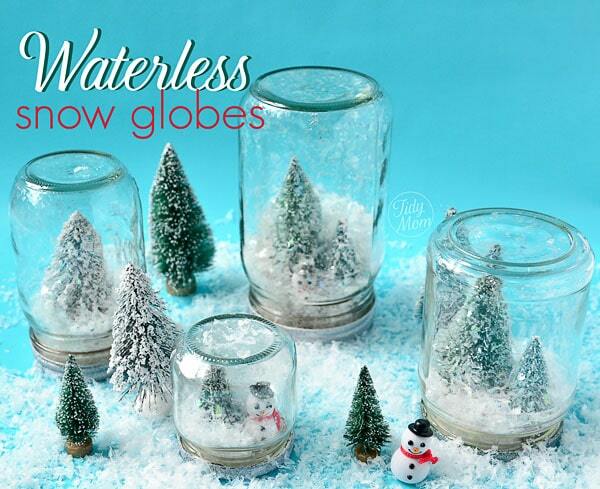 Like This Waterless Snow Globes Tutorial? Pin It! 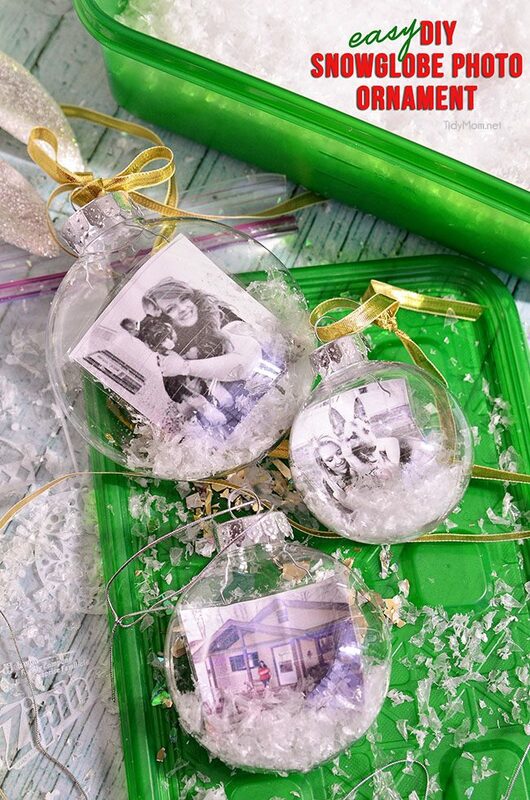 Easy DIY photo snowglobe ornaments are a fun easy project and will make a wonderful personalized gift, addition to any tree or tie one onto a gift for extra special gift wrapping. Want something a little more grown-up and elegant, but full of holiday glitter? 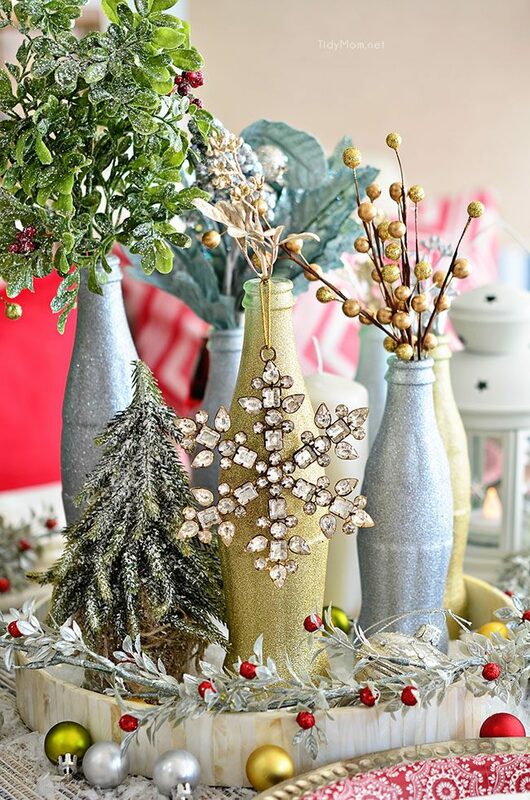 Use empty Coca-Cola bottles to make a pretty holiday table centerpiece. Just paint with glitter spray paint and add some holiday florals, and arrange on a tray. Easy and costs almost nothing! Or go REALLY simple. 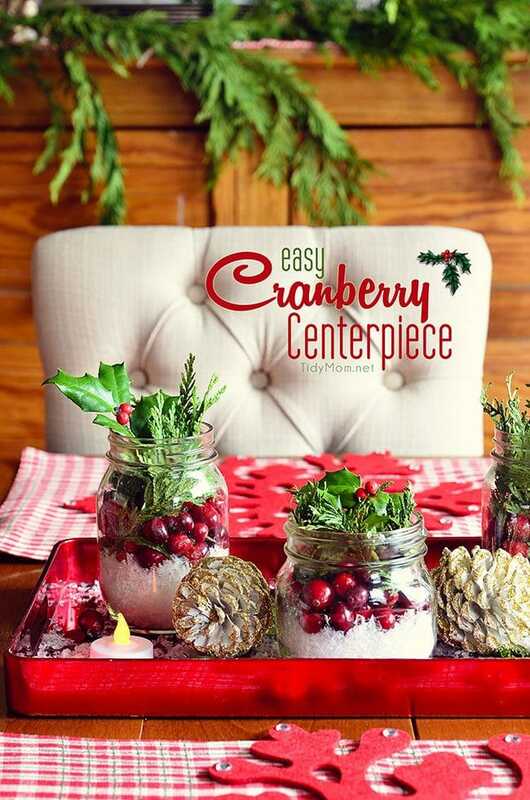 There is something magical about bringing the outside in, with this Easy Cranberry Centerpiece for the holidays. These are adorable. I made a couple last year but plan to make more this year! One that I have seen and loved is a car with tiny tree tied to the top with bakers twine. Super cute!! 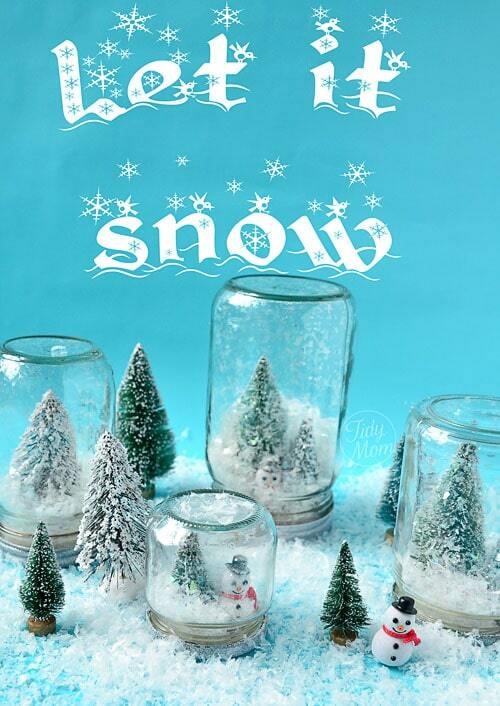 Do you know where I would get the Christmas treees and snowmen that would fit in the jars? Thank you! I found mine at the dollar store .3 figures to a pack for a dollar. I have tried this but the glitter sticks to the inside of the jar and makes it hard to see through. Is there something I can use on the inside of the jar so it won’t stick? 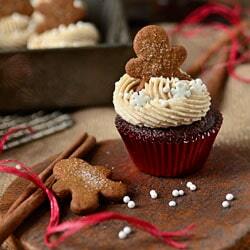 Where can I find the mini snowmen? Thanks! The glitter clouds the jar so I guess I won’t use it. And how did you use the twinkle flakes. It’s a paste like consistently and I don’t see your instructions for use. It’s listed in items so I ordered. Please advise the project is set for this week. Thank you for your time. have fun, they’re really very easy! Glue gun does not work it unglued after 3 days.